Team spirit, face paint, the rivalries and traditions make for a truly memorable event each year. Face paint adorning every cheek, crowds of excited students swarming over fields to cheer on their team, loudspeakers and trumpets adding to the shouts and screams of the supporters. High stakes, competitive spirits running high, bragging rights at risk…. you might think this is the NCAA National Cross Championships but there’s far too much mud being flung up by hundreds of pairs of spikes to be some stateside golf course race. 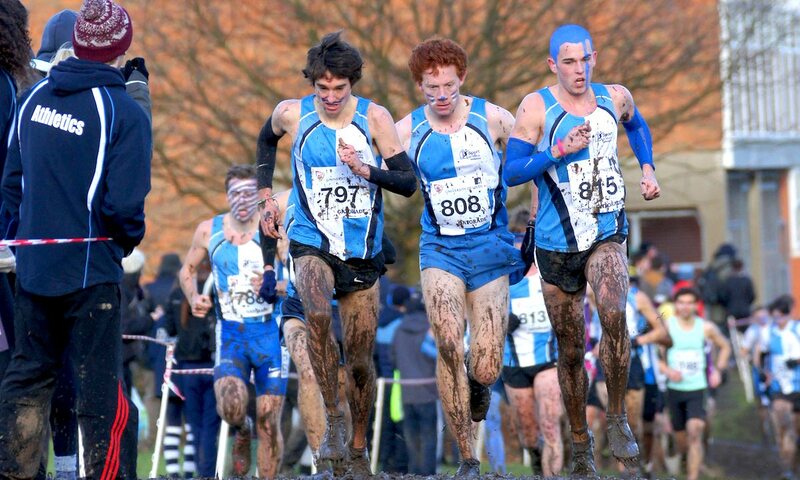 This is the BUCS Cross Country Championships, the NCAA’s less flashy cousin, emergent as one of the most atmospheric and exciting days of racing on the domestic calendar, largely due to the rivalry and team camaraderie that is unmatched in other UK races. 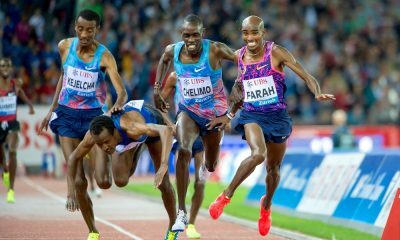 Despite athletics being an individual sport, there is still ample opportunity to compete as part of a team. Road and cross country relays, point-based cross countries leagues, club fixtures on the track, even track relays, all give runners the chance to be part of a bigger picture, to work alongside teammates for a collective result. While athletes might train together a few times a week at their club, there are few places where a tight-knit team unit can be forged like those made in the university running clubs across the UK. Students will train together almost every day, live in neighbouring streets or shared houses, study together and drink too many beers together at the union. By the time BUCS rolls around each February the students have had at least five months, or for the older athletes, almost three years, of team bonding time – these guys are ride or die. When the time comes to put yourself on the line for your team, the students are ready, willing and able. So keen in fact, that in 2009, when the race in Aberdeen was called off the night before due to heavy snow, over 100 students refused to be put off, and still turned up to the race venue to run around a course marked out by their own footprints on a communal warm up. And that was in the days when the festivities were limited to a bit of face paint and a few ribbons from the most militant of universities. Since then the hype around BUCS has just kept growing. You might not find a tent village to rival those you’ll see at the National (tuition’s £9000 now, can’t be throwing money away on gazebos) but what the students lack in infrastructure they make up for in noise. 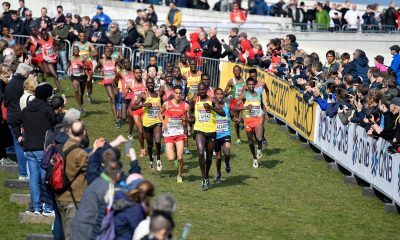 Loud hailers, trumpets, cow bells; the result is a cacophony that turns narrow areas of the course into corridors of noise, and the finishing straight will often become a tunnel of people and sound, especially in the event of a close competition. Teams make stencils to painstakingly decorate their cheeks with their university’s mascot. And there’s always at least one joker who’s covered head to spike in purple, red, or blue and white face paint. 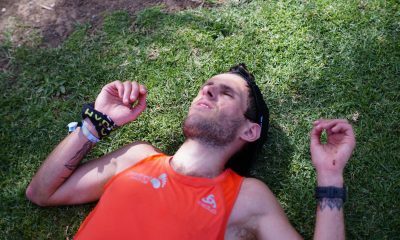 It is often the same joker who will win the annual race to be at the front after 400m, thus gaining maximum exposure of their war paint. Students’ commitment to BUCS is tested by the fact that the competition rotates between the home countries, with regular excursions to Scotland and Wales and the occasional jaunt to Northern Ireland. No other national cross country event is hosted in such far flung locations. The Inter-Counties stays resolutely in the Midlands, and the English National is limited in its travel by Hadrian’s Wall and the Severn Bridge. Perhaps BUCS’ nomadic status is in its favour. The course will be unfamiliar to all but the host team, keeping racing fresh, and nothing builds a team bond like 10 hours in each other’s company on the M1. Students from all over the UK descend on one ‘lucky’ town, arriving the night before the race, quietly preparing for the race ahead, then painting said town red at the after party. While the traditions and hype around BUCS cross country grow each year, so does its popularity with the UK’s student athletes. Participation numbers have grown from a steady 700 to 800 total competitors in the mid-noughties, to more than double that in 2018 when a record 1609 competitors toed the line across the three races. Much of that increase has come on the female side, growing from less than 300 up to 2010, to a record of 704 finishers in 2018; an increase unmatched in any other domestic competition. The inclusive nature of the women’s race – everyone gets a run, and team mates who will finish first and 501st will all line up together – may well account for much of that growing popularity. 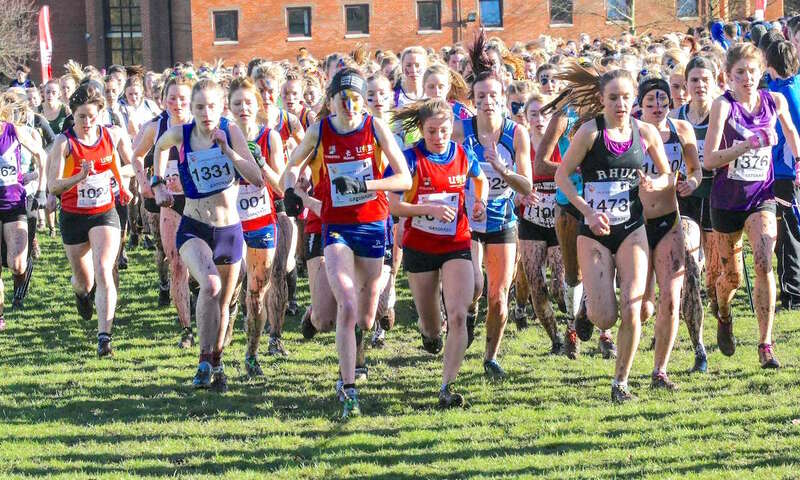 While BUCS cross country’s popularity may be on the rise, it has always been a favourite with talented cross country runners. 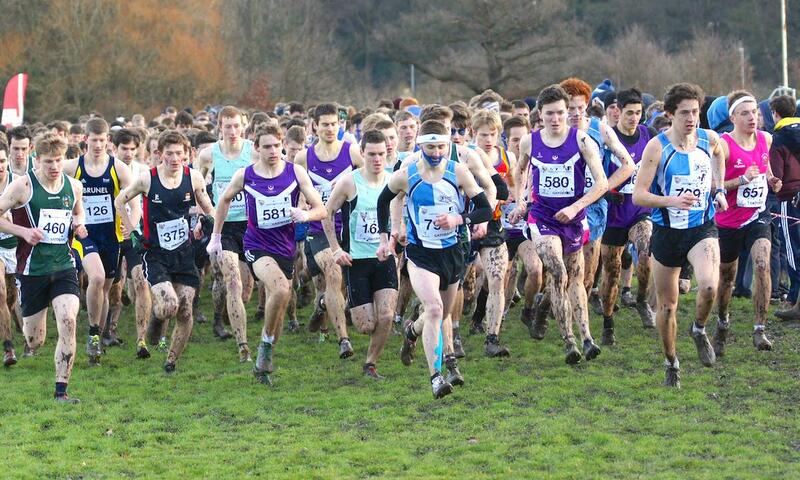 Former cross country and mountain running international Steve Vernon, and who now coaches the successful New Balance Manchester team, was a regular at the competition, winning three individual medals and picking up team titles with both Loughborough and St Mary’s in his early career. 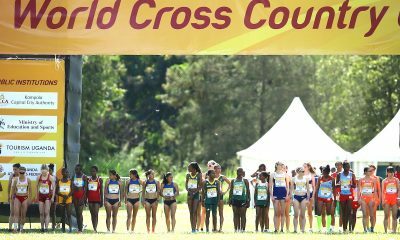 He found that it was a good stepping stone from junior races into the longer senior ranks, and would often use the race as a build-up to the World Cross Country trials. Another, perhaps less expected, fan of BUCS cross is Adelle Tracey, sub-2:00 800m runner and European finalist. Known for her speed on the track, Tracey says she loves the challenges of true endurance. She also connected with the team aspect, which is no surprise as she captained the St Mary’s team in her third year there. 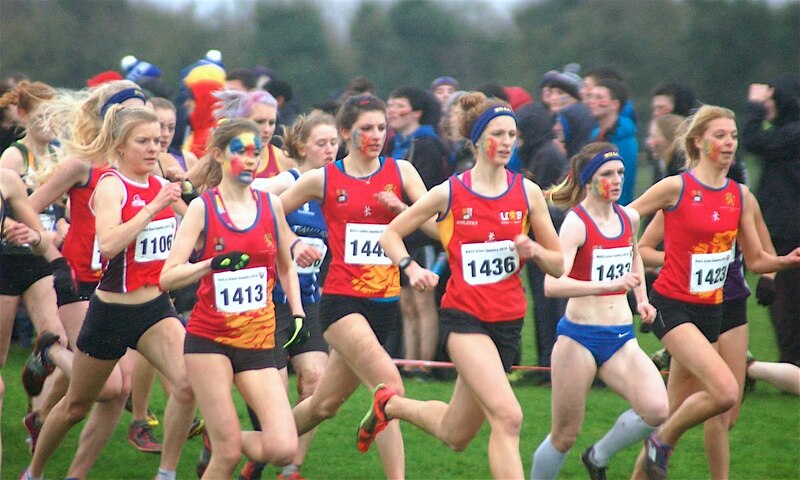 Even for those who might not be at the sharp end of the competition, it’s not hard to pin-point BUCS cross country’s enduring and indeed growing charm – the team spirit, the rivalries and the traditions make for a truly memorable event each year. For those whose university days are long behind them, I hope this has been an enjoyable reminder of the magic of BUCS. After all, a little nostalgia never hurt anyone. For those who are lucky enough to be competing this year, enjoy!